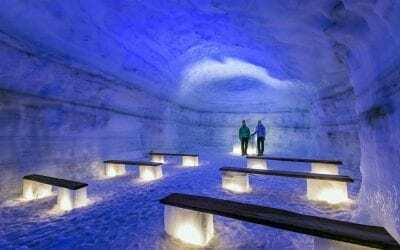 At Iceland’s second largest glacier, Langjökull, you can find a breathtakingly beautiful man-made ice cave you can easily visit all year round. It is actually the largest man-made Ice Tunnel in the world and has quickly become one of the more popular tours in Iceland. Find out more! Where is Into the Glacier located? 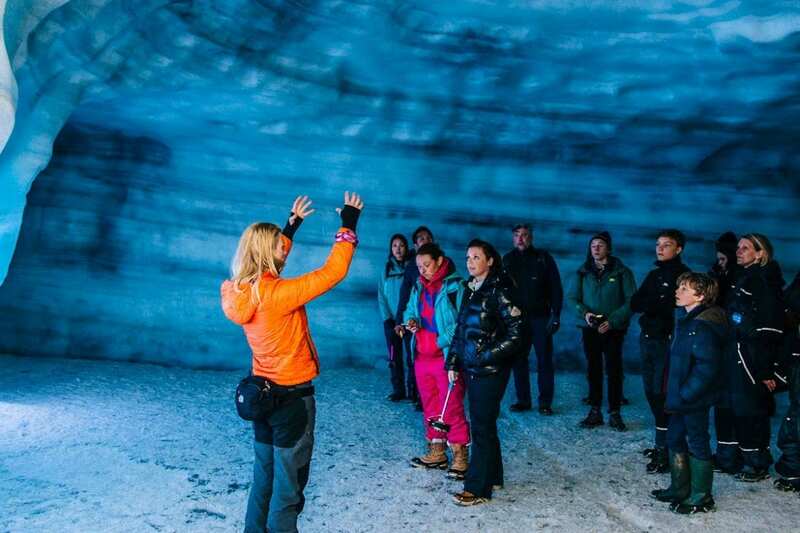 How to be dressed on an Into the Glacier tour? Langjökull or the long glacier as its name would be translated to in English is the 2nd largest glacier in Iceland and covers an area of about 950 km². It is on average about 1200 to 1300 meters above sea level and sits on a massive plateau of hyaloclastite mountains. 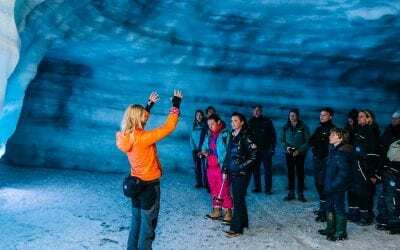 Until only recently the what lies beneath the surface of this voluminous glacier remained a mystery known only to a few glaciologists and scientists but today you can visit the blue ice wonderworld that awaits inside the glacier. Into the Glacier is a glacier adventure tour where you take a monster truck ride up onto a glacier, dress in your warmest and literally, step into the glacier. 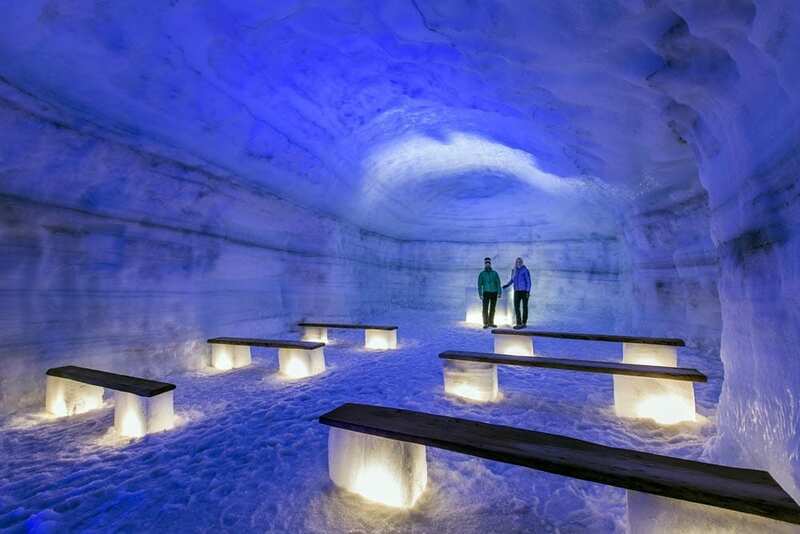 Inside the largest man-made ice tunnel in the world, you will find different layers of ice and volcanic ash, incredible crevasses and ice sculptures and even an Ice Chapel! This tour truly is an adventure to remember. The tunnel has been lit up to show you the geological wonders and the history of the ice cap and as a welcomed extra, providing you with plenty of photo opportunities! 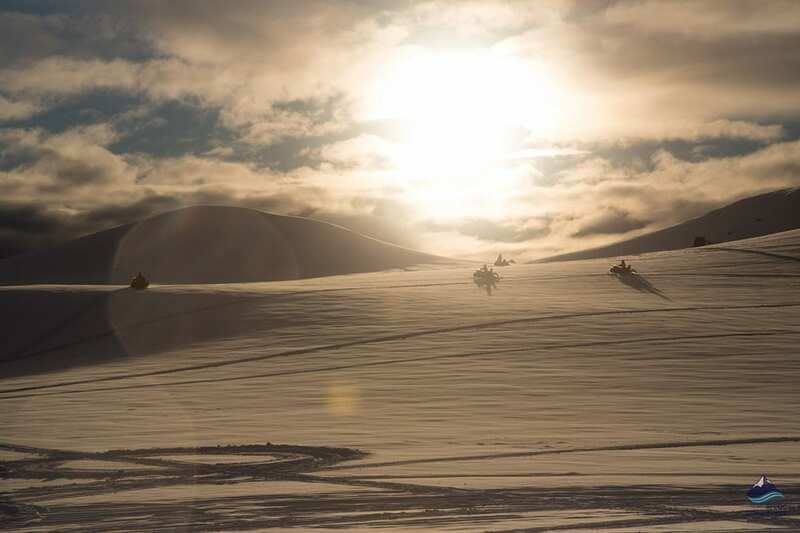 The story of the Into the Glacier adventure begins in 2010. Two men, by the name of Baldvin Einarsson and Hallgrímur Örn Arngrímsson, started to dream about an ice cave on the glacier. Before this time no ice cave had ever been found on the glacier so in order to make this happen the ice cave would have to be man-made. By this time people, especially tourists, had already started to explore the glacier, on glacier hiking or snowmobiling tours but they had a vision of taking the unique experience of exploring a glacier in the North Atlantic to a new level. They wanted to take them to the heart of the glacier and knew that Langjokull, which is very often snow-covered, possessed a truly captivating array of blue colored ice and this is something they wanted to share. With this bold vision, they set sails and gathered a team of top engineers and a geophysicist. They were to study the glacier, plan, model and prepare the construction and with a whole lot of determination the dream started to take form. These experts along with their scientific expertise and of course some financial and political support were able to turn the dream into the largest man-made ice cave in the world. The glacier Langjökull was once called Baldjökull. 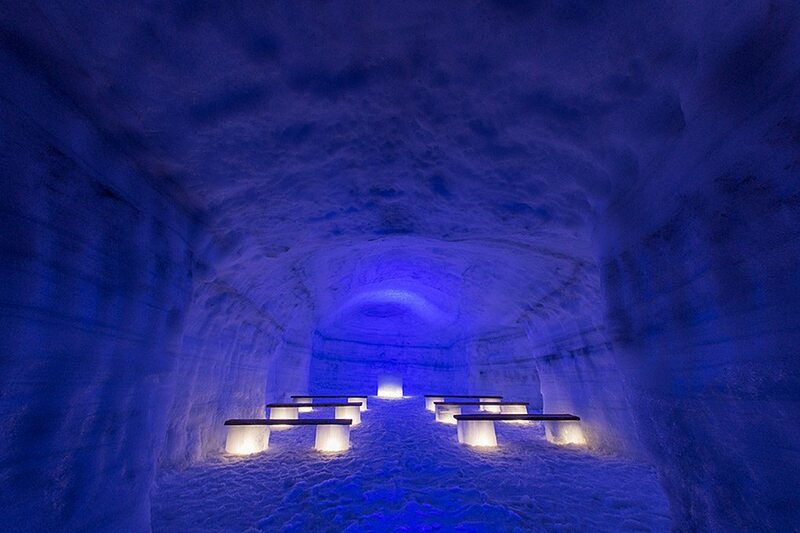 There is a chapel inside the ice tunnel and wedding have been held there! Some believe that Langjökull was once two or more glaciers that then merged together to form one big one. Langjökull glacier reached a record size in 1840. Close to Langjökull is an icecap called Ok, which was once a glacier but lost its place on the list due to its shrinking size. This is often referred to as the Icelandic version of the Pluto. Into the Glacier is located on Langjokull glacier at the southwestern corner of the glacier. Its closest recognized attraction is the Deildartunguhver hot springs and the Krauma baths that sits right beside it. The distance from Reykjavík is about 150 kilometers or 93,2 miles. You can easily get picked up in Reykjavík for the Into the Glacier experience but for those who have a car on their own, they can meet up closer to the cave. The tour departs from two different locations, Húsafell and the Klaki Base Camp. During winter the meeting point is at the Húsafell Center (from the 16th of October to the 31st of May). At Húsafell you will be picked up on a monster truck and brought by expert drivers all the cave’s mouth via the Klaki Base Camp. Not only will this be an adventurous experience on its own, driving over rough terrain in a gigantic vehicle but also is it safer for those driving in a smaller automobile or don’t have driving experience in this sort of terrain. This is why the road leading to the site is closed off from regular traffic during this time. With the exception of the monster trucks of course. During summer (from the 1st of June to the 15th of October) participants meet at the Klaki Base Camp. Note that 4×4 vehicles are required to get to the Klaki Base Camp. The drive from Reykjavík to Húsafell Center should take about an hour and 40-50 minutes. Note, there is another Húsafell in the South so you need to be extra careful to follow us to the right one. You follow Ring Road one in a northerly direction, past mt. Esja and onwards through the undersea level tunnel Hvalfjarðargöng. Just as you are about to drive over the bridge to Borgarnes you see a sign to the right pointing onto road 50. Take that turn and continue onwards into the beautiful Borgarfjörður. This road you keep on for 33 kilometers (20,5 mi) even though it changes its ranking to 518 at the Deildartunguhver Hot Spring intersect. You make a left turn off the 518 to the Húsafell center for the meetup and the Into the glacier Super Truck is very obvious! The drive from Reykjavík to Klaki Base Camp starts out the same as the drive to Húsafell. Out from Reykjavík via road 1, through the undersea tunnel in Hvalfjörður and right before reaching Borgarfjörður you make a right to road 50. This road you continue on for a long time, a few miles in it changes to 518 but you continue past Deildartunguhver, Reykholt and Húsafell. You make a right turn into road number 550 just as you are passing out from a small forest. Note that road 550 is a gravel road and only suitable for 4×4 vehicles. Make sure your rental is allowed on F-Roads before entering. If not we urge you to book the pick up from Húsafell. About 20 minutes driving on 550 will have you at Klaki Base Camp, it is a white hut and marked with Into the Glacier signs. The tour departs from Klaki Base Camp approximately 40 minutes prior to the scheduled departure time from Húsafell. Please check in at Klaki base camp at least 15 minutes before your tour. Warmly! No matter the season, you are still visiting the inside of a glacier and will need to dress accordingly. Dressing in wool is advised, thermal underwear and thick socks are also great! Inside the tunnel, you will be provided with ice spikes for your shoes so make sure to wear boots with sturdy soles so they will fit well and you won’t feel the spikes through them. The closest camping ground to the Into the Glacier cave on Langjökull is the one at Húsafell. There are a few camping grounds at Husafell all of them very popular. The main one is located in between summer cottages and therefore has all the basic services on hand. It is within walking distance of the nearby golf course, the swimming pool and a playground for the kids. You can even find a small supermarket in the cottage neighborhood and of course the Húsafell Bistro Restaurant. The facilities at the campground include showers, bathrooms, electricity, running water hot and cold, cooking stations, washers and tumble dryers. Price: Adults pay per night 1500 ISK with an additional cost of 400 ISK for each tent. Open: 20th of May to the 20th of September. The other two campgrounds are the Vallarsvaedi and Reydarfellsskogur. They are located about 2 km (1,2 mi) away from the main one and offer more basic facilities. Price: Adults pay per night 1100 ISK and children (7-17) pay 600 ISK. There is an additional cost of 400 ISK for each tent. 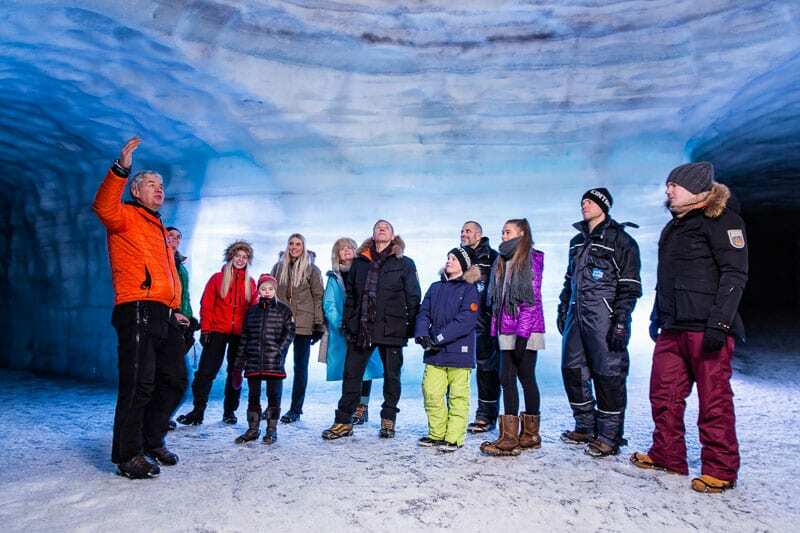 The Into the Glacier tour runs all year round and can easily be done at any time. 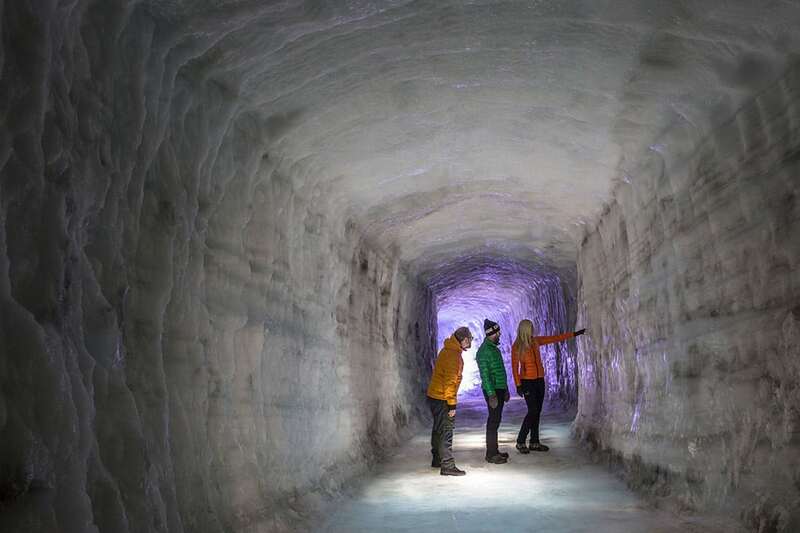 The fact that it is man-made works to our advantage here as the weather gods don’t control the operation of the tour as much as they do with natural glacier ice caves. The main difference is where you can meet up for tours. During winter you cannot meet up at the Klaki Base Camp as the road leading to it is closed off for regular traffic. Your options in winter are meeting the tour guide at Húsafell or simply have them pick you up from Reykjavík. Day tour from Reykjavik to visit the man-made ice tunnel in Langjökull, Iceland's 2nd largest glacier, ride in a super truck and visit some famous attractions.